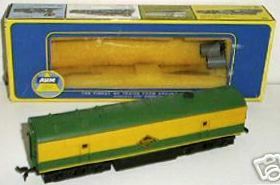 The added "D" next to the "dash F" in the AHM stock number indicates this B&O C-Liner B-unit is a non-powered or dummy example. What are those circular gray plastic tubes on the C-Liner you ask? They are Yugoslavian Coupler Protectors. Certain releases from Yugoslavia included these gray plastic tubes to protect the X2F couplers from damage. The tube fit over the coupler and coupler pocket. 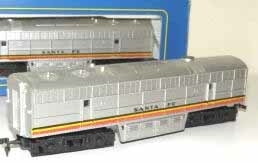 In addition to AHM releases, I've seen these gray tubes on American Train & Track items. 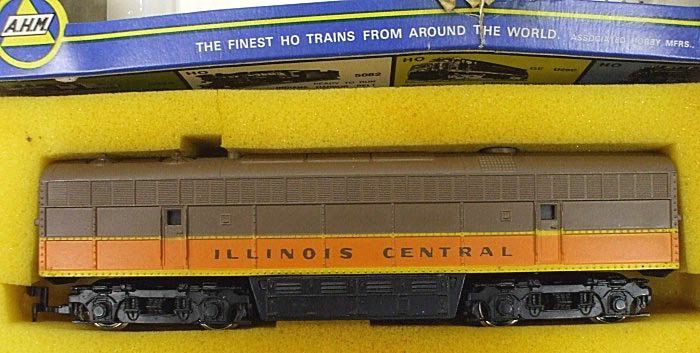 AHM's booster C-Liner is reviewed as a new product in the March 1965 issue of Model Railroader magazine. The review notes that the Rivarossi-made FM C-Liner B-unit is a scale 6" wider than the prototype. 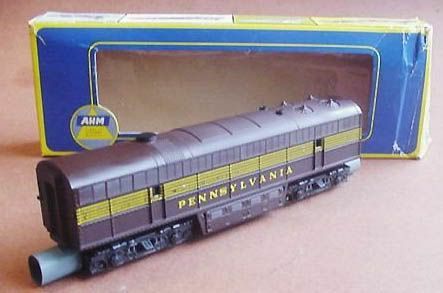 The MR review includes the model's original retail of $3.98, which was a non-powered example, and the original release roadnames: Santa Fe, Reading, New Haven, Pennsy, Baltimore & Ohio, and Milwaukee Road. AHM certainly offered a wide variety of roadnames for its C-Liner models. Original buyers for the FM C-Liner series diesels included: Long Island Railroad, Milwaukee Road, New Haven, New York Central, and Pennsylvania in the U.S. and Canadian National and Canadian Pacific in Canada. Fairbanks-Morse built its Consolidated or C-Liner series of locomotives between 1950 and 1954. You may read about Fairbanks-Morse, the maker of the prototype C-Liner diesel locomotive a Wikipedia.org.